We greatly appreciate how fortunate we are to live in this lovely location and we want to ensure that our heritage and idyllic surroundings are here for others to enjoy in the future. This is undoubtedly a work that is in progress, we encourage guests to have good environmental practices when here, whilst enjoying a relaxing break. Please offer us any suggestions to assist us. We strongly support the local recycling arrangements, therefore glass, tin, food waste, plastic, cardboard, and paper are collected separately. Notices and a variety of different bins at each cottage support this. Additionally, we have a compost bin in the garden for those who wish to use and newspapers are recycled within each cottage to light the log burners. Household textiles are recycled and if guests chose to leave items of clothing or shoes, we return to the guests whenever possible, but otherwise, donate the items to a charity shop. Batteries and printer cartridge refills are recycled responsibly, we are happy to responsibly dispose of any batteries you may discard whilst at the cottages. Lightbulbs have been gradually replaced by LED equivalents. Most radiators have been fitted with individual thermostats. Outdoor lighting is fitted with dusk to dawn sensors and is a low output, so that if they are not switched off by guests, then they are not left on during daylight. Most radiators have been fitted with individual thermostats. Appliances are regularly monitored and when replaced we select energy efficient models. Bedlinen and towels are generally washed at our base where electricity is supplied from solar panels on the roof. Whilst it is a requirement of 4* and 5* Visit Wales grading to have washing and drying facilities, we personally do not use the drier, preferring to utilise the fresh air and breeze supplied by nature on a hilltop location. Surprisingly both cottages have areas where most washing will dry overnight if the weather does not allow outdoor drying. We are attempting to reduce our paper trail and do as much of the booking, confirmation, payments, receipts etc online. 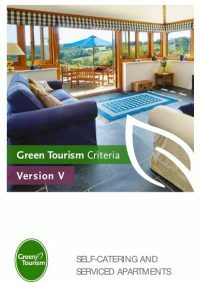 Environmentally friendly products are used to clean the cottages. We supply eco-friendly washing powder, washing up liquid, dishwasher tablets and toilet rolls for our guests. Both cottages have a septic tank system, therefore we avoid strong detergent products and carefully select the toilet paper. Most toilets minimise water use or have a dual flush system and we urge guests not to throw any other items into the system. The CH boilers are regularly serviced and have both been replaced in recent years, thus making for more efficiency. We do not restrict timing or temperature of the CH, but do request guests to be sympathetic to their consumption and request that the heating is not used when they are away from the property for long hours. There are log burners in both cottages, the CH being more than adequate, but guests can enjoy the atmosphere of the log fire. The logs and kindling that are used in the cottages are cut by ourselves from any fallen trees and branches found over on our neighbouring farmland. Guests are welcomed with complimentary tea and coffee, generally Welsh Brew tea and one of the many Welsh roasted coffees, Welsh milk and often a homemade Barra Brith traditional tea bread. When supplies allow, we give guests fresh eggs and homegrown vegetables. We offer maps and guidance on places to visit, so that good use is made of their stay at the cottages. Rather than aimlessly wandering, concise day trips can be planned, with lots of hidden treasures shared with guests. Bike storage is available thus encouraging a car-free day or two. 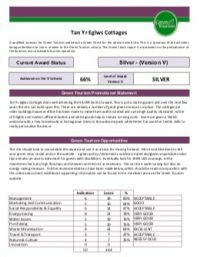 Here at Tan yr Eglwys Cottages, we are committed to providing a quality service whilst minimising the environmental impact to the best of our abilities, whilst ensuring guests have a comfortable and enjoyable stay. Guests are welcome to bring their own bikes and there is secure storage available. The cottages are convenient to Sustrans Route 43. We are able to recommend cycle hire in a variety of landscapes, be it coast, countryside or city. Consider having a car-free day whilst staying here, either relax at the cottage or enjoy walks from the doorstep on footpaths over fields or along the country lanes, observe the farm animals or wildlife. Neath rail station is only 4 miles away and catch the train to Swansea or Cardiff and once there try a boat trip. Please use the recycling system, there are bins provided for glass, tins, cardboard, plastic, paper and food waste. Newspapers can be kept aside for lighting the log fire. Seasoned recyclers may wish to make use of our compost bin in the garden area where some vegetable peelings and eggshells can be composted. When available you will be rewarded with seasonal vegetable produce from our garden. We encourage you to use our local independent shops in Pontardawe and beyond. We have a local butcher, fruit and veg/health shop and a variety of other small gift shops, all with quality products. By choosing to shop independently rather than have the usual supermarket experience, you may add to your holiday experience and also support private enterprise and the local economy. Neath, Swansea and Carmarthen and Cardiff have unique indoor markets, Swansea being particularly large. On the weekends, monthly farmers markets are held in the Marina and Uplands in Swansea, mumbles, and Brecon. Do make the effort to rise sharply a discover a wealth of local treats. To enable our septic tank to run smoothly, please only flush toilet paper down the toilet system. Please use energy wisely. We do not restrict the CH but request that heating and lighting is used sensibly and appliances are not left on standby mode. When using the log fire for its cosy effect, consider turning down the CH rather than opening the windows. You are encouraged to dry your washing outdoors on the shared washing line – a satisfying experience! Please leave any hazardous waste such as batteries to one side so that we can safely dispose at our local recycling centre. We urge you to venture outside, especially in the darkness on a clear night. It is a pleasure to enjoy the uninterrupted night sky and hear nature at night. We thank you for helping us to be as eco-friendly as possible. If we all do a little bit we hope to make a difference.